Did you know that Tretchikoff was the first artist to print and sell reproductions of his work? Well he was and the prints we are selling are in fact these very first reproductions that were printed over 50 years ago. 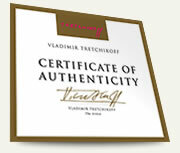 Our Tretchikoff Letterpress Prints have been produced to the higest quality under the artist's personal supervision and are accompanied by a signed Certificate of Authentication. These prints are from Tretchikoff's personal collection, having been produced to the higest quality under the artist's personal supervision and only released by his family for sale now - so you will be the first owner! Each print is delivered impeccably packaged to your door with a signed certificate of authentication by his daughter Mimi Tretchikoff.